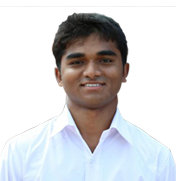 Gajula Praveen kumar, a young innovator and a multilinguist having strong domain knowledge pursued his MBA in Agri Business Management at Sri Sri University, Odisha. He is a member of Agri Conclave and Infrastructure at Sri Sri University moreover worked as an intern at BAIF (Rural development program) and ARVI Innovations. He worked as a Project officer at Agastya International Foundation, Bangalore for 2 years and travelled across 12 states in India for the ‘Moon Mission’ project. Now, started working with Kakatiya sandbox as a Program officer. His long term goal is to start a '	Gaushala' for the cattle protection. As a social entrepreneur, he urges to serve the nation. He is passionate in knowing and updating new trends in agriculture also to know about the spirituality, yoga as well desires to transform the chemical farming into organic farming. He is skilled in socializing and coordinating the people moreover in scientific researching. His confidence in the face of hard work is driven by the ability to come out of challenges.